When my husband and I found our small homestead (just under 3/4 acre) a few years ago, here in the mountains of Southern Nevada, we were SO excited! Actually, we still are! It's in a beautiful place, the neighbors are generally like-minded and amazing people, and best of all---it's OUT of the city---about an hour to be exact. Ironically, the one sticking point for us was that it was Off the Grid! Being off the grid was something we had to give some thought to, and be sure we understood before jumping in. We have always relied upon city water, city electricity, city gas, basically city everything (like most of us in these modern days) for over 50 years (106 between us!) ---So, this was a BIG step. Especially since the solar system we inherited was quite old and definitely not in the best shape. Now, after four years of living off the grid---I'm not sure I could go back to being beholden to "city utilities." What Does Living "Off-Grid" Mean? Someone recently told me that we don't REALLY live off the grid. Well, I hated to inform that friend, that actually---we do live off the grid. And just because a person lives off the grid does NOT mean they don't have running water, or power, or never blow dry their hair. Off-gridders can run a clothes dryer if they want to, and yes, they can have running water. And we can even have neighbors! Now, there are different levels of living off the grid. I know of some homesteaders who have just packed up to live on raw land without a septic system, power of any kind, or even running water. They do things like haul water from a nearby spring, use wood-fired stoves to cook, and use different kinds of facilities for sewage. I know of one couple who only burns candle light for lighting! These kinds of off-grid lifestyles are hard-core, friends. However, we are not hard-core. Call us soft. Call us sane. You see, the fact of the matter is, I have grown rather fond of being able to blow dry my hair, have power at night, and enjoy running water. I like baking my bread in a gas oven. Just saying. It is entirely possible to have power, running water, and a septic system, and still be considered "off-grid." Being off grid means not paying a single utility bill to a city, county, or state entity! Our solar system was an ancient and often disabled thing for quite some time. And trust me, when you are just coming home from work in the dead of a cold, dark, windy, snowy winter evening and discover there is no power....major BUMMER. When we first moved here, I can't tell you how many miserable hours I waited in the cold and dark, with just candles & firelight until Mr. V. could get home and figure out what was going on out there with the solar system. Our solar system is away from the house, so in order to get it going again (with a gas generator or by making adjustments), we had to actually brave the winter night and elements. However, we made it work, sketchy as it was. In the past few months, we have been blessed to be able to have set up a brand new solar system with excellent panels and nickel-ion batteries that are supposed to last 100 years---I won't be around to find out if that is true....but for now, that is hunky dory dandy with me! It was expensive, but so very worth it. The electrical set up in the house is similar to what you find in your typical on the grid city homes. The difference lies in how the power gets into the house and other areas on the property. Basically, the sun hits your solar panels, then channels that energy to an inverter, which then channels the energy to batteries that store the power for use. It's truly a magical process, I can tell you. I admit I do not fully understand it. My husband (and a really great neighbor) are the masters of that arena. Not having electricity or just having to be so careful with the electricity stored in the batteries we had was the hardest thing about going off the grid for me. It seemed it was out for about 2/3 of the winter before we got our new system in. But we are good to go now with the new system! It's pretty wonderful, because it holds so much power it's like being in the city. We now have a large, brand new and up-to-date system. In fact, the batteries are guaranteed to last 90 years! This is some reliable solar power, and we rarely have to run the generator as back up. Thank goodness. I didn't take a picture of the battery bank, but those are substantial and high quality. The heating system in our home is a combination of propane gas and (soon) wood-burning stove. Being used to having the gas man come out and hook things up from a pipe in the earth to having to have a very large propane tank in the yard was also a big change. It's our responsibility to keep the propane tank filled up! Nobody is out here checking on us to make sure we have enough propane to make it through the cold winter months (here the temperature can get down to the single digits). Plus, the price of propane in this area of the country is not that great (in my opinion). That's why we are moving toward the wood burning stove and a pellet stove in the garage---it will save money, and we have heard they actually work far more efficiently. AND I can actually COOK on the stove! :) Excited about trying that! I'll let you know how that goes! Here is our stove. Sorry---I've got some of my tinctures, herbs, and seeds up there right now. It's summer, after all! Learn to make your own handmade natural soap! I grew up in Las Vegas, Nevada on an acre of land. My dad always had a huge garden, plus we had our horses. It was a great life growing up there back in the 1960's and 1970's. Las Vegas wasn't even "all" that big back then--about 200,000 people when I was 10. But....that was before the extreme water restrictions took hold starting in about the 1980's and 1990's. With the population growth in Southern Nevada, the immense and ever increasing casino/hotel industry, new golf courses....and on and on...., water restrictions have been in place there for literally decades. How frustrating is it to finally grow up and own a home and not be able to plant a decent sized garden because it is just too cost prohibitive? Sure, I was able to plant my container gardens, and I became a master at planting my garden plants into the beds that held our fruit trees and landscaping, but it wasn't like a real garden. Out here in our small community, we are allotted a certain amount of water per month to use from the well that serves our village, and it is plenty to keep up large gardens (herbs, veggies, flowers). We didn't plant any grass out here in our yards because I feel it is just not using space wisely. Instead, every bit of land possible at this point (and more in the future) is planted with healing herbs, spices, and warm to cool season vegetables. Here's a link to one of my favorite books about using permaculture in your yard: The Suburban Microfarm, by Amy Stross. It's inspiring! I LOVE water! I have such an appreciation for what we are given here. Here are Ginger and Bud grazing in our front yard. No, it's not pretty grass, but it's sure healthy---especially for the Mojave Desert. I grow Mullein, Dandelion, Chicory, Calendula, Goats Beard (you can eat the root), Burdock, Hollyhock, Chamomile, Yarrow, St. John's Wort, Echinacea, Lemon Balm, and Marshmallow out front here. Crazy! Just water and grow! It's a medicinal front yard. 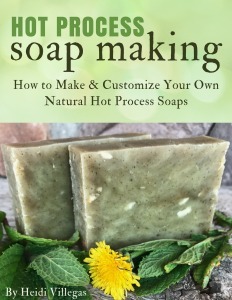 Learn how to make your own natural hot process soap with one never fail recipe and recipes for variations using herbs, clays, and essential oils. Available on Amazon Kindle too! What on earth would we do without a system to contain our waste? There is no city sewage system out here. We have a septic tank. This wasn't a huge change for me, because back in the day in Las Vegas, where my family lived (in the Boondocks it was called back then), we were on a septic tank too. So I knew what that was like. What I wasn't prepared for, though, was a sewage back up on New Years Day, which also happened to be a Sunday! YUCK! Now that was awful! We couldn't get anyone to come up from Las Vegas, I had to work the next day, so it was a REAL emergency! I mean: we had raw sewage coming up in the toilets and showers. GROSS! We finally found a man who came all the way around the mountain from a town even farther than Las Vegas to drain it for us. He was amazing. Between Mr. V., my daughter's super strong boyfriend, and the man from Pahrump, NV, they dug several feet into frozen solid ground to find the tops. Suffice to say, it cost a pretty penny, let me tell you. We just have to be a little careful about how much water we use in the house, because it drains into the septic tank. Luckily, it's just my husband and myself these days, and since we are empty nesters now, we don't worry about the septic system as much. I love living off the grid. Although the electrical power was truly frustrating at first, I would never, ever have traded the small inconveniences to go back to the city. EVER. One day, Mr. V. and I will be able to buy our dream homestead with some actual acreage, with some pasture land and more space for livestock and an even larger garden, and I sure hope it's off the grid. Do you live off the grid? What are your experiences with well water, septic, and solar power? I would love to hear your advice, experiences, and questions! P.S. Don't forget to sign up for the Healing Harvest Newsletter. You'll get a weekly update, information about promotions occasionally, and free eBooks that are added to as I get them finished! This article was shared at these link parties: To Grandma's House We Go and The Homestead Blog Hop. It may also be shared over at The Homestead Bloggers Network.